Sometimes, turning your wedding planning visions into reality doesn't accommodate your pocketbook, especially in such economically trying times. Thankfully, being frugal and budget oriented does not mean taking away from the special details that will make your wedding unforgettable. Too, DIY is not always budget-driven creativity is important and getting-it-exactly-right as well. Either way, do-it-yourself weddings are "in" and with so many couples embracing the DIY movement, we 're always busy helping you along the way with as many easy, affordable and practical ideas as we can collect. 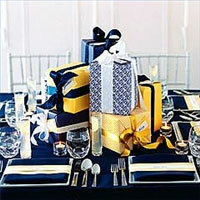 Today, more "do-it-yourself" centrepiece ideas that will impress even your most discerning of guests. 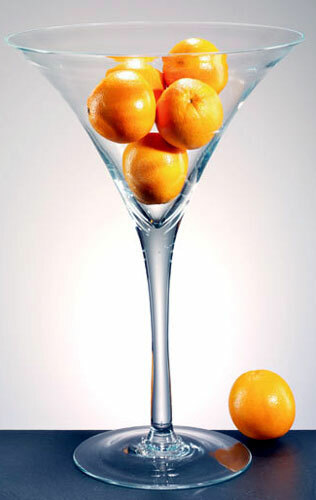 Rent some large Martini glasses (or other glass vases) and fill them with either clear or coloured gel balls; add a small LED light or candle. 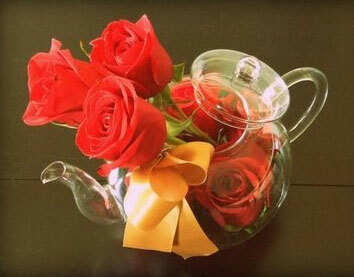 Or, skip the candle and add flowers or seasonal fruit. 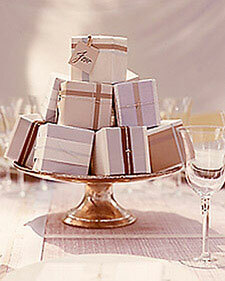 There is a great discussion (with more examples) about this idea, on Jenberg's Pink Wedding blog. 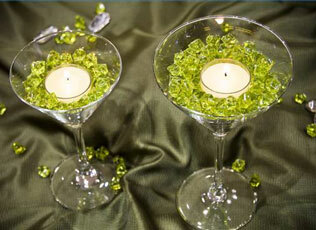 Or, place one single flower in a wine glass; you can even add some pearls to each for effect. 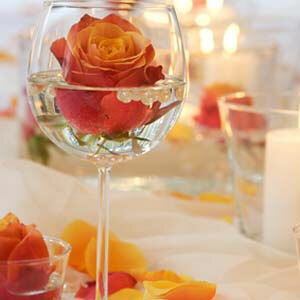 Assemble three or more of these glasses on your table's centre and you have a very unique and elegant centrepiece. 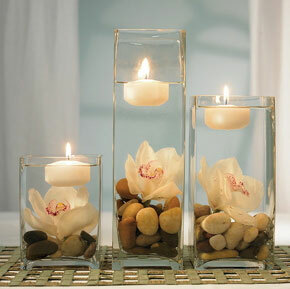 If you don't like tall vases, you can use a short vase with a candle in it and place the flowers around the vase like a wreath. 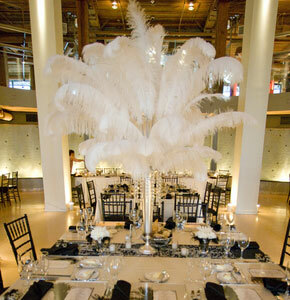 Décor Idea: Ostrich Feather Centerpieces? 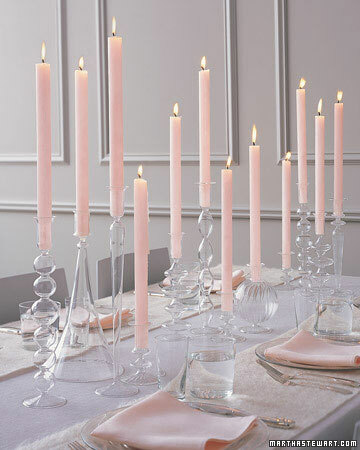 Candles are always a wedding favourite. 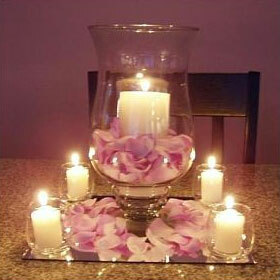 You can buy lots of candles and arrange them any way you like to create a memorable and eye catching centerpiece. 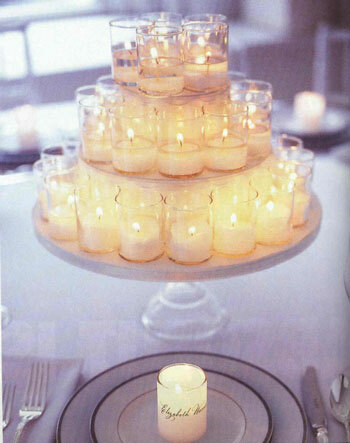 For example, buy lots of little candles and a multi-tiered cake plate for each table. 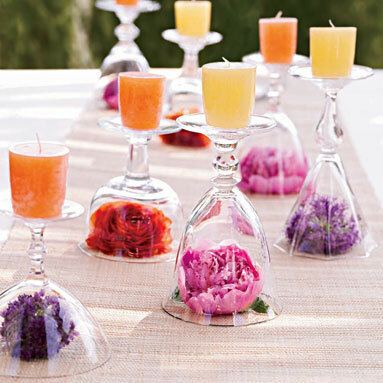 Arrange the candles on each cake plate to create a stunning illusion. 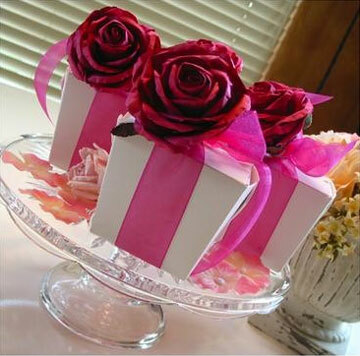 Boxes come in all shapes and sizes and can add lots of texture and colour to your table. 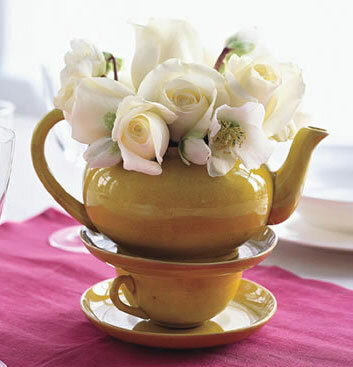 For example, arrange lots of little favour boxes atop a single tier cake plate to add height and interest to your table's centre. 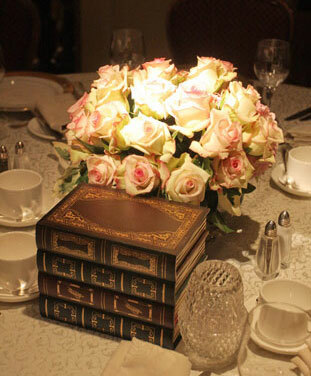 Make sure you have boxes in a variety of colours to add an extra element to your display. Another option is to buy slightly larger boxes. 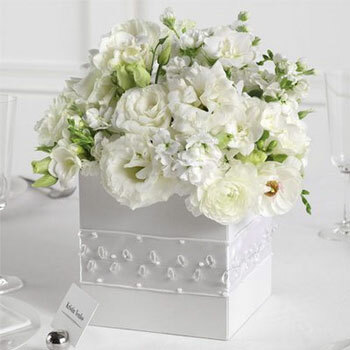 Decorate them in your wedding colours, then add flowers to the top of each box. idea by CrazyForTea.com - of course! 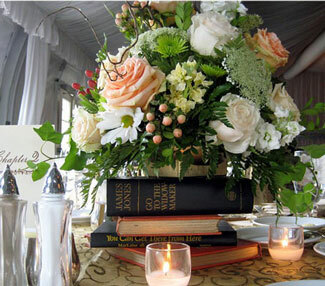 Or perhaps you are book lovers; stack several books asymmetrically on the table with some flowers on top..
"Creating centerpieces for your wedding can be fun and creative. 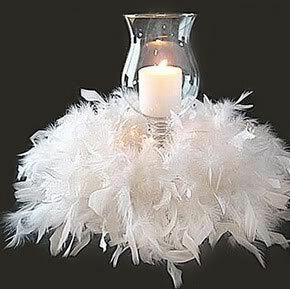 Just use your imagination and you will undoubtedly come up with something that will be a one of a kind DIY masterpiece! "..